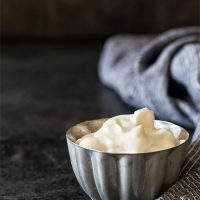 Learn how to make Small Batch Homemade Whipped Cream from scratch without throwing away leftovers! With only 3 ingredients and 5 minutes of whipping time, you will never buy canned whipped cream again. Makes enough whipped cream for two servings. One of my goals for this year is to retest and rescale recipes to be more small batch friendly. I’ve been blogging for almost 12 years now. Although I’ve been scaling down recipes for two most of my cooking life, I haven’t always blogged that way. It’s one of the few things I regret about blogging; I wish I would’ve started this focus much sooner. I’ve always hated making a big batch of whipped cream from scratch because I would always have leftovers in the fridge. And since whipped cream isn’t something that lasts more than 1-2 days, I end up throwing the rest out. Cue sad face. After years of making it, I figured out the proper proportions for Small Batch Whipped Cream from scratch, which makes whipped cream for two servings. I even figured out how to make flavored whipped cream too, including peanut butter and chocolate. I’m going to do a miniseries posting each recipe separately (because who knew I could write so much about whipped cream?!). I promise it’ll be worth it! They’ll be posted throughout the month, so be sure to sign up for my email newsletter. That way you’ll know exactly when they’re posted! First up is my Small Batch Homemade Whipped Cream. It’s probably the most used recipe on this blog. I’ve always made it since I could remember; very rarely do I buy the canned version. 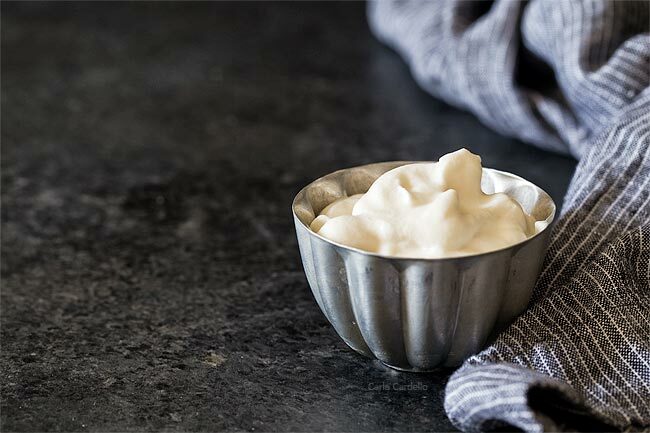 Another name for homemade whipped cream is Chantilly cream, which is the French name for it. It’s not a term I personally use, but if you see it on a menu, it’s good ol’ fashioned whipped cream. 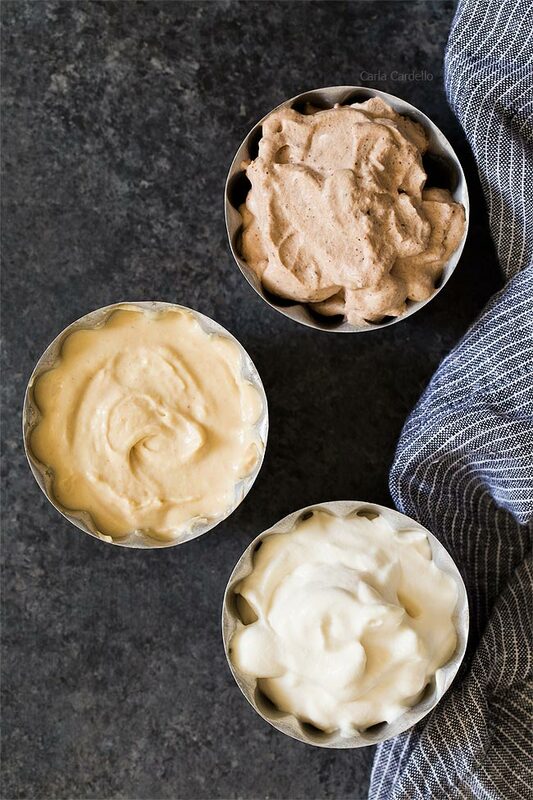 With only 3 ingredients and 5 minutes of whipping time, you will never buy canned whipped cream again. 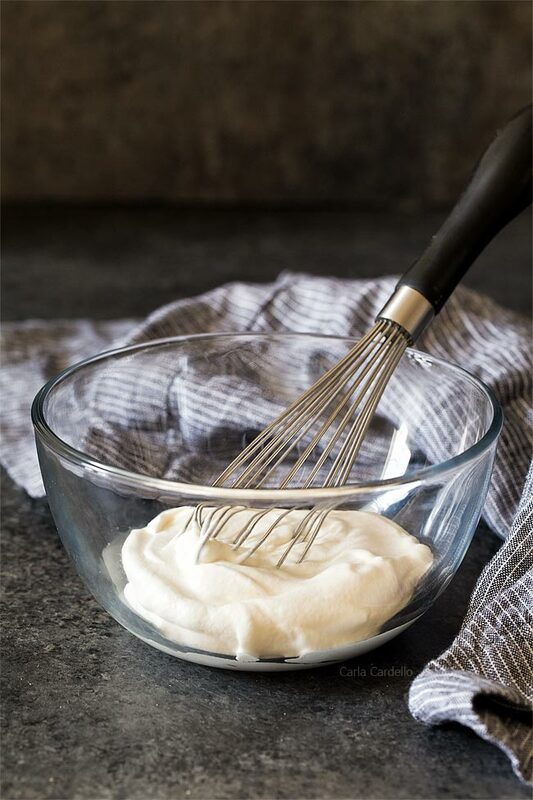 The ingredients for homemade whipped cream are simple – cold heavy whipping cream, powdered sugar, and vanilla extract. You can certainly add other ingredients such as peanut butter or cocoa powder, but they all start with the same three ingredients. I highly recommend looking for heavy whipping cream vs. whipping cream (without the word heavy in it). 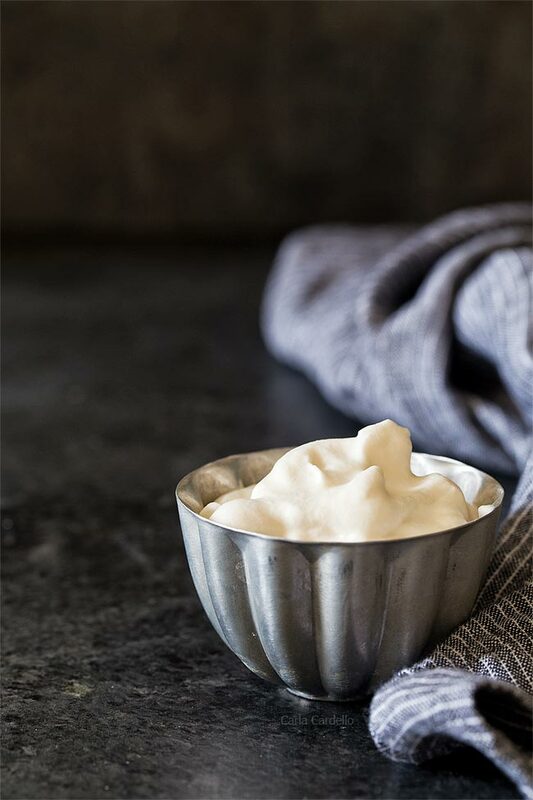 Although both produce luscious whipped cream, heavy whipping cream has a little more milk fat at 36%, which whips better and holds its shape more. Whipping cream only has 30% milk fat, so it’s a little lighter and a little more time sensitive. That means it won’t hold its shape as much. If you’re eating the whipped cream right away, such as on hot chocolate, using either type of cream will work. However, if you need the whipped cream to last longer, such as on top of a pie, you’ll want to use heavy whipping cream. Learning how to make whipped cream is so easy, you’ll wonder why you bother buying canned whipped cream. I keep a constant supply of heavy cream in my fridge, so it’s much easier (and faster) to make my own than run to the store. I never chill my bowl or beater before whipping. Starting with a cold bowl certainly helps, but truth is I never remember until I actually start to make it, then I get too lazy and impatient to wait an extra 15 minutes to chill. Chilling is more necessary if your kitchen is super hot, especially in the summer, but it’s certainly not a disaster if you forget to chill. I feel like I’m committing a cardinal kitchen sin admitting that, but I’m keeping it real with you. You do, however, want to always start with cold cream. Which is even better because then you don’t have to wait for it to come to room temperature. Next, you want to start beating on high speed until the cream starts to thicken. At this point, you can gradually add in the powdered sugar and vanilla to sweeten up the cream. 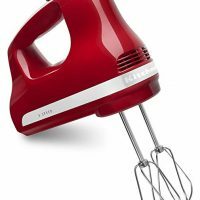 Keep beating on high speed until stiff peaks start to form, which is anywhere from 3-5 minutes, depending on the speed of your mixer (or your arm muscles). This means when you pull the beater straight up, peaks will form in the cream and will not fall over. If the tops of the peaks do fall over, that is the soft peak stage, which means you still have a few more minutes of beating left. Once you reach the stiff peak stage, stop beating. If you go further than that, it’ll get grainy then eventually turn into butter. If you do find yourself with overbeaten whipped cream, add in another tablespoon or so of cream to help smooth it out. As I mentioned earlier, I got tired of making a giant amount of whipped cream, only to throw out the extra later. That’s why I opted to share my Small Batch Whipped Cream recipe. So, how DO you make whip a small amount of cream? 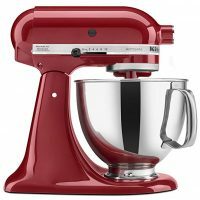 With 1/4 cup heavy whipping cream, you can still whip it up in a 5 quart stand mixer bowl with your whisk attachment. That’s the method I prefer since it’s hands off. However, you can use a smaller bowl and a hand mixer. I find using a hand mixer doesn’t whip in as much air, but the difference is minor when you serve it. 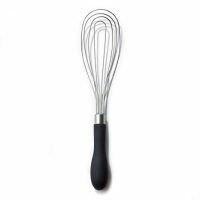 If you find yourself without any mixer to use, you can certainly whip the cream by hand with a whisk. Not only does this build arm strength, the whipped cream will taste better since a lot more love went into making it. Using 1/4 cup heavy cream means you’ll have about 2 servings of whipped cream, perfect for small batch desserts. If you find yourself cutting that in half to literally only 1 serving, you will probably have to use a hand mixer because the stand mixer bowl will be too big for 2 tablespoons cream. Homemade whipped cream can be made in advance because it’ll last about 1-2 days in the refrigerator. It will deflate as it sits, but it’ll be fine to spoon alongside some dessert. You can also re-whip deflated cream to put more air back into it. Be careful you don’t overwhip it into butter. Additionally you can freeze whipped cream to make it last even longer, about 2 months or so. I like to portion the whipped cream onto a cookie sheet (either piped or spooned), freeze until firm, then transfer them to a freezer-safe bag. That way, they’re ready to go for hot chocolate and individual desserts. Learn how to make Small Batch Homemade Whipped Cream from scratch without throwing away leftovers! 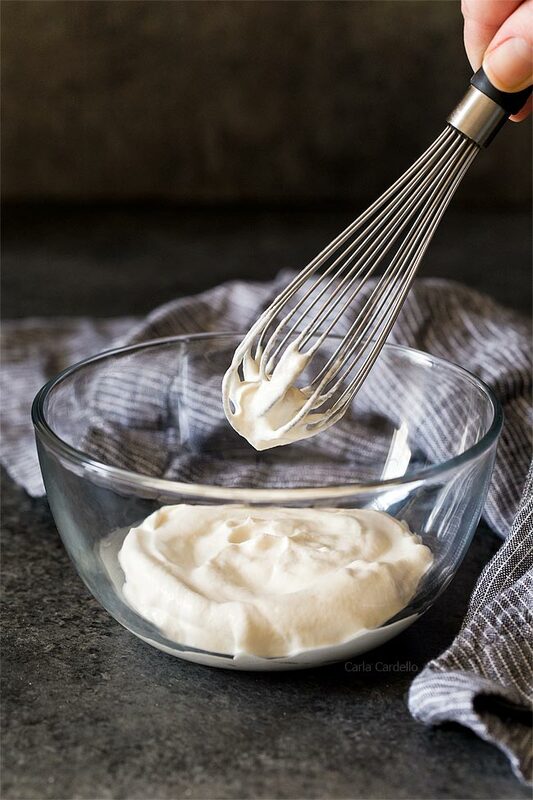 With only 3 ingredients and 5 minutes of whipping time, you will never buy canned whipped cream again. In a large cold mixing bowl on medium-high speed (with whisk attachment if using a 5 quart stand mixer), beat the heavy cream until it starts to thicken, about 1 minute. Gradually beat in the sugar and vanilla then continue beating until stiff peaks form (when you pull the beater up, peaks will form and not fall over), about 3-4 minutes. Serve immediately. Store in the refrigerator for up to 2 days. The longer it sits, the more it'll deflate but will still be edible. Additionally you can freeze whipped cream to make it last even longer, about 2 months or so. Portion the whipped cream onto a cookie sheet by either piping or spooning, freeze until firm, then transfer to a freezer-safe bag. 1/4 cup of cream will not work in my KitchenAid stand mixer as this not enough to whip into anything. I do whip 16 oz of heavy cream in my mixer and freeze what I don’t immediately use. It worked in my 5 quart bowl for my KA stand mixer, but if it doesn’t work for yours, you can definitely use a hand mixer with a smaller bowl. I do a lot of “for two” desserts and small batch whipped cream is the way to go.. I also keep heavy cream handy..
Great tip on freezing.. I’d thought about it but, haven’t actually done so. Oh yes the freezing works wonders! Since I made three flavors at once for this miniseries, I froze the leftovers and been using them in hot chocolate. I always make my own whipped cream. Home made Chai whipped cream is truly my favorite. 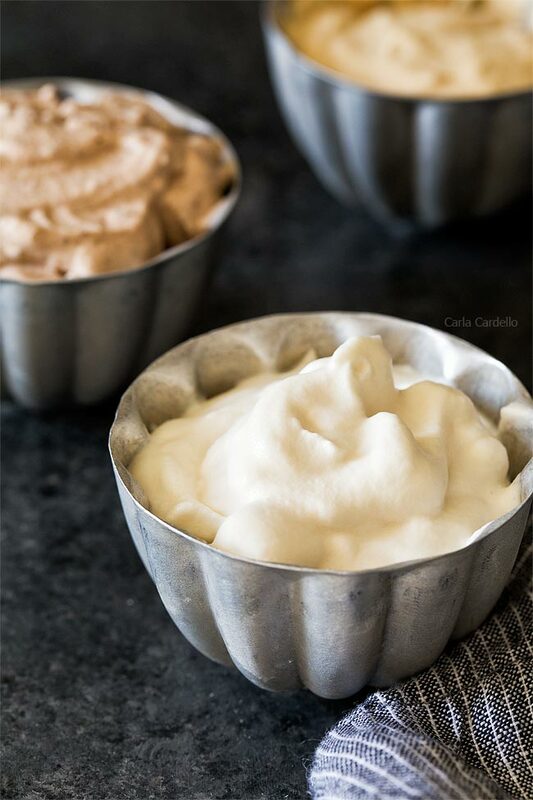 Have not tried freezing it but I will now, Here is a wonderful Chai Chantilly recipe, it is sooo darn delicious on many things like French toast instead of butter, banana muffins, chocolate cake instead of frosting etc. Oh…. and just by the spoon full, in your mouth . Thank You Carla, for sharing the freezing bit ! Ohhh I love chai spices and think that chai whipped cream sounds heavenly! Thanks for sharing. Wonderful! Let me know if you try it, Kayle!